BHUBANESWAR, India, Oct 13 2012 (IPS) - In the aftermath of a natural disaster, women are often the most vulnerable. Particularly in rural areas, women suffer disproportionately from inadequate shelter and poor sanitation facilities and are often tasked with rebuilding shattered homes. The theme for this year’s international day of disaster reduction, led by the United Nations Office for Disaster Risk Reduction (UNISDR), is more relevant than ever: ‘Women and Girls: The [in]Visible Force for Resilience’. Across India, droughts and floods – which Rajan Joshua of the Society for Education and Development (SEDS) described as “two sides of the same coin” – have put scores of women at risk, but also highlighted their ability to endure and adapt to even the most harsh conditions. Vikrant Mahajan, chief operating officer of Sphere India, a New Delhi-based non-governmental organisation working on disaster relief operations in the subcontinent, told IPS, “Forty-nine percent of all disaster survivors are women”, many of whom face extreme challenges in the post-disaster period. While conducting field research for her PhD, Parimita Routray, a student of the London School of Hygiene and Tropical Medicine in Bhubaneswar, encountered shocking tales from rural women across the eastern state of Orissa, which is prone to floods, sea surge, storms, cyclones and seawater incursions. The lack of facilities itself is a “disaster in the making”, especially in a state that is susceptible to a host of natural catastrophes, she added. “Women from the Kusupur village in the Puri district of Orissa, told me they find it extremely difficult to manage in flood or cyclone shelters, especially during their (menstrual cycle),” Routray added. At nightfall women must bear the additional risk of encountering floating animal carcasses or live snakes struggling to survive in receding waters. Without proper toilets they are also more likely to contract waterborne diseases, and must guard against epidemics like cholera, malaria, dengue and diarrhoea. Crime rates, too, rise inevitably along with floodwaters, often hitting women hardest. Mamata Nayak, the village council chief in Chahabatia village in Puri, told Routray that when outdoor areas used as toilets are submerged by floods, whole families are forced to defecate on dried cow dung cakes inside their homes, and then dispose of the waste in the water outside. The Kosi River flood, which impacted over 3.3 million people in India’s western Bihar state in 2008, highlighted another aspect of women’s vulnerability to natural crises. For miles around, agricultural fields were submerged in silt, leaving millions homeless and preventing farmers from cultivating their fields. The desilting process has not been completed to this day, forcing men to migrate in search of employment. The women left behind were tasked with repairing homes that had been destroyed in the floods, as well as running households on next to nothing. Even today, “Women (lament) that government officials who interview them for compensation demand that they produce property papers (land deeds) in order to legally claim compensatory housing,” Jaya Jha, coordinator of collaborative advocacy with Sphere India told IPS. 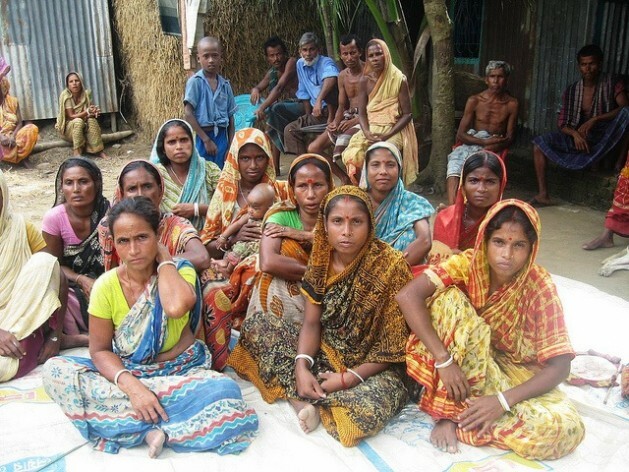 “These women are now desperately in need of shelters, water and sanitation. Inadequate power supplies and a dearth of health care services are worsening the situation,” she added. Because they bear the brunt of disasters, women are determined to find ways to mitigate the effects of natural calamities. “So instead, women in the villages cultivate gherkins, onions, garlic, tomatoes and aubergines. The only fruit we can grow is bananas. All our food recipes utilise these commodities to balance our nutrition needs – our staple diet includes maize flour-based steamed cakes and lentil salads,” she said. Annie George of Building and Enabling Disaster Resilience of Coastal Communities (BEDROC), an NGO involved in tsunami relief in the town of Nagapattinam in Tamil Nadu, believes women-led efforts are the best solution. Strong policies, legislation and other supportive structures and networks are “essential and the governments should take this aspect very seriously”, she added. In the Anantapur district of the southeastern state of Andhra Pradesh – a region afflicted by drought in six out of every 10 years – droughts and floods are becoming more frequent due to climate change. “For SEDS (located in Anantapur) it was clear that the women and the community as a whole need to be able to produce, reproduce and invent ways to mitigate disturbance of their livelihoods as a result of climate variations,” SEDS CEO Manil Jayasena Joshua told IPS. “We support community organisations, (traditional) agricultural practices, natural resource management and health services,” Joshua stressed. “All our projects, programmes and trainings are aimed at promoting self-reliance for rural women in the disaster-prone Anantapur district. An integrated approach is essential for long term disaster risk reduction,” he added.